Imperio! Now that you are under my spell and must obey all commands, come check out the magical ideas shared in this Harry Potter themed birthday party by Allison from All for the Boys. 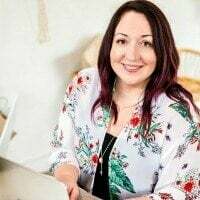 Thrown for her Harry Potter loving 7 year-old son’s birthday, Allison brought the details of the book alive through her creative dessert table, Harry Potter themed games, joke shop favors, food and beverage choices! 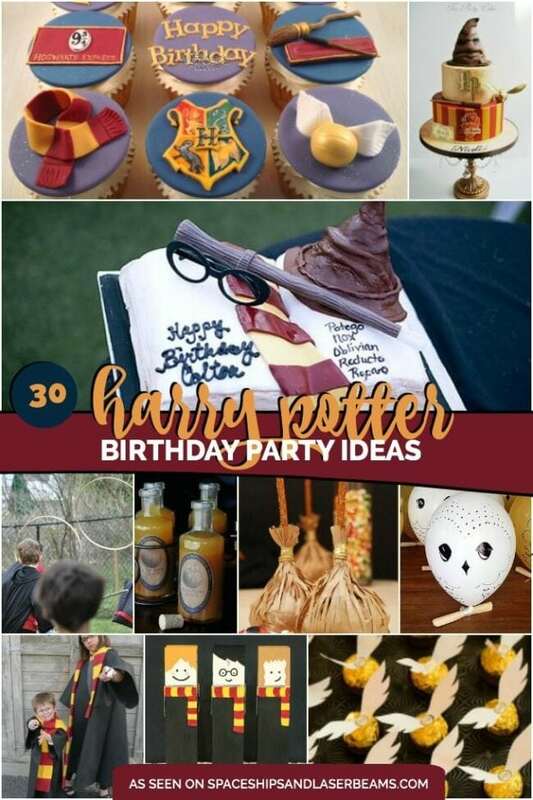 See Also: I love these Harry Potter birthday party ideas and I’m sure you will as well. Guests immediately fell under the spell of the magical wizarding world upon entering this party. Allison had prepared an exciting roundup of activities, all inspired by various passages in the Harry Potter series. It started with the impressive Platform 9 ¾ banner which was displayed at the party entrance. Every wizard in training knows that the entrance to Hogwarts can only be obtained through that special passageway. Once inside, guests played in the transfiguration (photo) booth! This was easily made with crepe paper streamers and a few props. Soon after all the guests arrived, a sorting ceremony was held. I can imagine the anticipation as each guest eagerly awaited their house assignment. Would it be Gryffindor, Slytherin, Ravenclaw or Hufflepuff? Which would you hope for? Little wizards also chose their wands, or as the story tells it, let their wands choose them. After the sorting ceremony and wand choosing it was time for potions class. Fun was had preparing a smoking, bubbling concoction of “Hippogriff saliva” (bubble solution) and “goblin crystal” (dry ice). Allison shared the boys’ absolute delight at hearing the bubbling of their potion. Other book inspired activities included a hunt for the golden dragon egg and a round of Quidditch. I love the use of a hula hoop to represent the Quidditch hoops from the book. Equally brilliant was the use of plastic balls for quaffles. Despite the 104 degree heat, I can imagine a lot of fun was had recreating this popular wizarding game. Following Quidditch, it was time for a refreshing drinkable color changing potion. Cleverly, Allison had put a few tiny squirts of food coloring at the bottom of each glass and topped each with ice without the wizards knowing. Each added Sprite to their glass and watched in amazement as the colors changed. Pop Rocks were added for an extra zip. So fun! If you’ve read the Harry Potter series, you know about Bertie Bott’s Every Flavor Beans. While there are some delicious bean choices, there are also disgusting flavors to be had like skunk, barf and canned dog food. Ick! Because nobody in their right mind would pick such horrid flavors on their own, Allison featured an awesome spinner game which allowed guests to test their bean picking prowess and luck. After some bad beans, it was time to fill up on some good grub. Allison prepared a spectacular assortment of traditional birthday party fare with clever book related names substituted to fit the Harry Potter theme. A few of my favorites were Drooble’s Best gum balls, Slytherin Snakes gummy worms, Acid Pops (Blow Pops suckers), Chocolate Frogs and even Caldron Cakes (cupcakes). Allison even made Butterbeer (cream soda with butterscotch flavoring). I absolutely love the printable labels. Served separately, an amazing book themed cake with incredible Harry Potter themed details was enjoyed. I think I can almost hear the sorting hat talking. Can’t you? One of my favorite dessert table details was the birthday banner hanging on the wall above the desserts. Would you believe Allison made this from actual pages of a used Harry Potter book, purchased for just over $1?! Allison also incorporated other used copies of the series in her dessert table styling. One stack of used books made a perfect dessert stand. Wizards don’t eat their nibbles in the kitchen. So off to “The Great Hall” they went. Allison had simple place settings with Mason jar mugs, napkin wrapped utensils and layered plates. While wizards enjoyed their snacks, Allison passed out owl print papers, foldable into airplanes. Guests were encouraged to compose their own Ministry of Magic memos to fly around. Unfortunately for these wizards this magical party had to end, but not before each guest visited the “joke shop” Allison had set up, filled with gag gifts and silly toys. Each guest got to “shop” in the store and pick out some party favors to take home. If this Harry Potter party didn’t have you under its spell, you may be related to “He that shall not be named”. I adored all of the book inspired details!